Cardinal Storm 205 Digital Weight Indicator. Local/Remote Standard. Stainless Steel Washdown Enclosure. Four Serial Ports and USB interface. LED Display. NTEP and OIML approved. 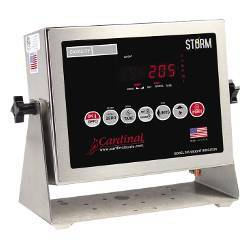 Cardinal�s USA-made model 205 and 210 STORM indicators are ideal for a wide variety of weighing applications ranging from bench and floor scales to the most sophisticated vehicle scale. The four serial ports and wireless capability with SnapStream ease interfacing with remote displays, printers and PC�s. 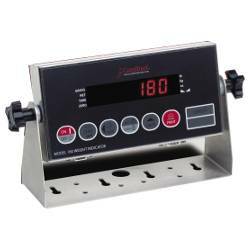 Whether you�re weighing a single animal or an entire herd, the 210 indicator makes it simple. Cardinal�s StableSENSE � digital filter minimizes the effects of moving livestock while the 210 can provide time, date, ID, consecutive number, gross weight, head count and average head weight for recording. Convenient print tab settings with X-Y coordinates make it easy to set up a ticket with the information you need to print for any ASCII printer. With Cardinal�s powerful nControl software you can create additional custom print formats for truck tickets, weight receipts, and even bar-coded labels to your specifications. Cardinal�s model 210 STORM indicator supports single and dual-speed digital fill control operation and allows a variety of discharge gate configurations. The 210 includes up to 25 stored preset / accumulators and remote inputs for Zero, Tare, Gross, Units, Start, Stop and Print. The 205 and 210 feature four bi-directional serial ports, USB-B standard, USB-A optional, plus the 210 offers 8-channel inputs/outputs. When equipped with Cardinal Scale�s proprietary SnapStream Wireless Interface, the 205 and 210 indicators can send weight data wirelessly to a host of peripheral equipment including printers, remote displays, PCs and networks. SnapStream is a fully integrated NTEP legal-for-trade wireless scale system for use in both commercial and non-commercial applications. Need a special application? Cardinal�s in-house software team is ready to write special software for both the 205 and 210 to meet your unique requirements. Note that the memory capacity of the 210 has been doubled from the previous version to support your most complex appli- cation. Please give us a call or e-mail to discuss custom applications! > INDICATORS > DIGITAL : 3 Items found. 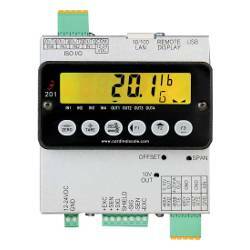 Cardinal 201 Din Rail Mount Digital Weight Indicator. Compact, fast and accurate. USB and Ethernet Interfaces. RGB LED backlight. 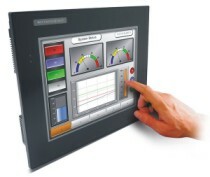 PLC Connectivity. IP-20. NTEP, UL and CE approved. 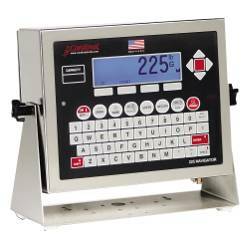 Cardinal Navigator 225 Digital Weight Indicator. Rugged IP66 Stainless steel enclosure. Backlit Graphics LCD Display. Querty Keyboard. USB Interface. Multi-Point Calibration and High-Resolution Mode. NTEP and OIML approved.